Spring and Easter rabbit pillow! This cute little guy reminds me of the rabbit in the movie Alice in Wonderland! He's checking his pocket watch- he knows it's springtime!!!! 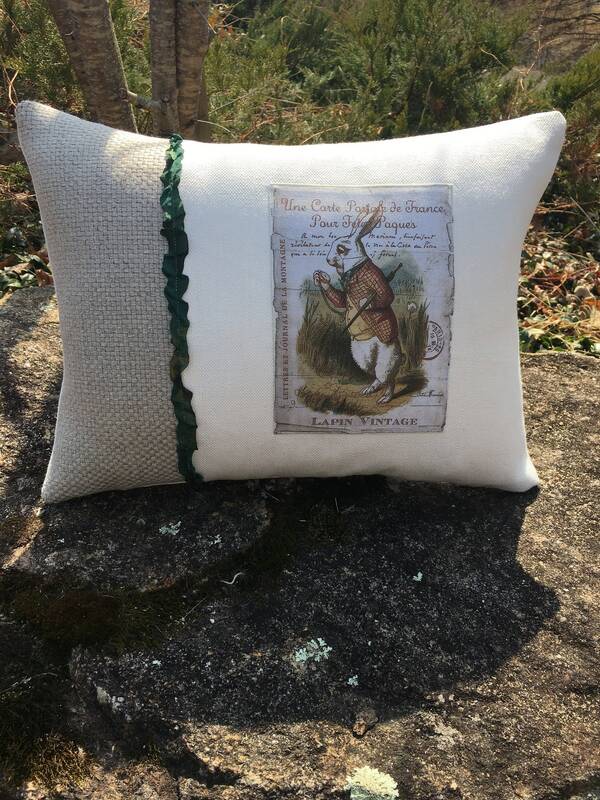 The front and back of the pillow are made from 100% Belgian linen- the front is two toned- snow white linen and a wonderful tan woven linen. I added a hand dyed wrinkled seam binding for a little contrast on the front. The back is snow white Belgian linen. The pillow measures 16 inches long by 12 inches high and is closed at the bottom with a zipper and includes a 95/5 feather/down insert. This pillow is in stock and ready to ship immediately! Happy Spring!